Remember the 1999 Major League Baseball All-Start Game at Fenway Park? It was the year Mark McGwire crushed pitch after pitch over the Green Monster in the Home Run Derby. I recently opened a wine that so competently delivered on what I'm looking for in an Oregon Pinot Noir that it reminded me of McGwire's performance in that competition. I'll definitely be buying more of this one, though I'm not sure about its availability nationally. 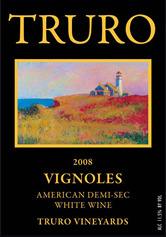 Wines from August Cellars have never been rated by Wine Spectator, and this vintage hasn't been rated by anyone else on CellarTracker. I bought it based on a recommendation from Steve Grant at Blanchards. If you're in the area, definitely seek out his recommendations. He hits for a very high average in my experience. McGwire didn't win the 1999 Home Run Derby. He tired after hitting 13 home runs in the first round and failed to advance to the finals hitting only 3 homers in the 2nd round. Funny how all I remembered was how he effortlessly smashed pitch after pitch over the wall. Can you guess who won it before looking? This $3.99 Pinot Noir "isn't that bad"
I've been tasting through highly rated Pinot Noirs lately and I'll be writing about my impressions of them in upcoming pieces. I'd love it if you subscribed to the site via E-mail or in a feed reader so you can hear about new content without needed to check back. 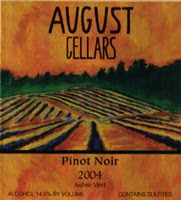 Question of the Day: Have you discovered any Pinot Noir values lately? We'd love to hear about them. First of all, I wanted to thank everyone for reading and commenting on the shelf-talker piece I submitted to Palate Press last week. The comments and discussion generated awareness around a subject I feel is important, and I really appreciate your support. 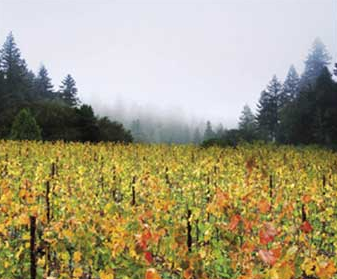 BOKX109 in Newton is having a 5-course paired wine dinner featuring Napa Valley’s Truchard Vineyard. I went to a similar dinner featuring wines from Robert Foley a couple of months ago and thought it was excellent: Very good food paired with outstanding wine. I'd appreciate if you clicked through and finished reading the story, and if you leave a comment on the site you'd be my BFF. Thanks for your support. Update (10/14/2013): This restaurant has closed. 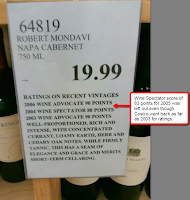 So often in discussions on wine and ratings, we seem to fall into the trap of saying which wine is better than another. I know I have. However, as I was trying to decide which restaurant to visit on a recent trip to New York City it occurred to me that it isn't a matter of there being a single "best" restaurant any more than there's a best wine. It's a matter of aligning our palates with what we're in a mood for at this point in time. Whether it be the flavor profiles we're comfortable with from past experience, the level of formality we're up for given the occasion, or the mood we're in given the season- it's all about combining the restaurant or the wine with the circumstances at hand to create a unique and memorable experience. As much as I love wine, I'm not big on restaurant wine lists. Few wines can deliver value when their release price is multiplied by 2 or 3 times and for me the experience of drinking a bottle of wine at a restaurant isn't highly differentiated vs. drinking it at home. Paired dinners can be great, but they're sort of a different animal vs. scanning an overpriced wine list as a steakhouse. One restaurant that's been on my mind ever since I received the cookbook for Christmas was Bobby Flay's Mesa Grill. The book is really beautiful to look at, and the recipes make my mouth water. However, they're not the easiest things in the world to make. Tons of ingredients in the name of the dishes alone tempt you to skip an element that might turn out to be essential. This, combined with what we were looking for on this occasion, made it the perfect place to try for our visit. I had some concerns about the restaurant after reading this negative review of another Flay restaurant. After looking around on Trip Advisor I was downright spooked: "On Par With Chili's" read the reviews. Hey- I don't think Chili's is so bad in the grand scheme of things (though I think I do understand the connotation the reviewer was aiming for) so I plowed forward. Unfortunately, when I tried to make a reservation on Open Table the restaurant was full all weekend. Fortunately, the concierge at our hotel and was able to secure us a reservation for 7:45PM on a Saturday night. We arrived at 7:30PM and our table was ready for us. We were seated at an excellent table at the front of the house. There was a lively crowd at the nearby bar, but we were able to hear each other talk. The tables were tightly packed initially, but the party seated next to us was a group of 3 so the tables were rearranged giving us elbow room. (In the image at the top of this piece, we were seated at the table to the right against the wall.) The waiter come over immediately, greeted us, gave us menus and took our drink orders. I ordered a glass of Malbec per a suggestion I got ahead of time from @TheWineExpert (The Capital Grille's Master Sommerlier George Miliotes). It was *fantastic*. I'm not certain of the vintage, but I think it was a 2008 Urban Uco Malbec. Tons of fruit to balance out spicy steaks. Highly recommended at about $10 a bottle in stores (or $10 a glass if you're in at Mesa Grill). When we had a chance to look at the dinner menu, I remembered why it was that I wanted to come here in the first place: 90% of the menu sounds so good to me. 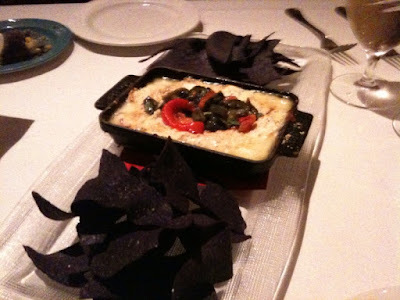 For an appetizer, we took our waiter Matt's suggestion of the Goat Cheese “Queso Fundido” with Rajas + Blue Corn Tortilla Chips. It was delicious. Salty cheesy goodness with sweet roasted red peppers and jalapenos. Cotija Cheese + Lime along as well as Mashed Potatoes with Cilantro Pesto. The Corn was outstanding and the mashed potatoes were very good. For entrees, Deanna chose the Cornmeal Crusted Chile Relleno filled with Roasted Eggplant + Manchego Cheese with Sweet Red Pepper Sauce + Balsamic Vinegar. 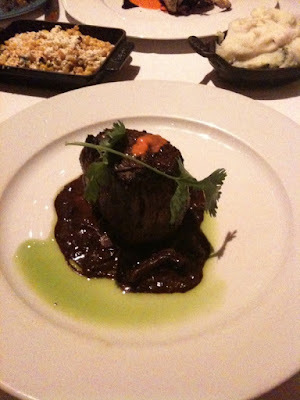 I ordered the Red + Black Pepper Crusted Filet Mignon with Mushroom-Ancho Chile Sauce. Both were very good. The filet was as massive as I've seen, but I would have preferred it to be a little more seared on the outside and a little more done on the inside. It was dark red in the center and I ordered it medium. No biggie- I was stuffed at that point anyway. We were doing so well with our waiter's suggestions that we couldn't resist a look at the dessert menu. We went for the Toasted Coconut Layer Cake with Coconut Cream Sauce. It was OK. A little dry- couldn't find the cream sauce. After our server comped our dessert for no reason in particular, our bill was $112.14 with tax. I thought this was extremely reasonable- an excellent value. Overall, I'm glad we visited this restaurant and I would recommend it to anyone who likes what they see from watching Bobby Flay on TV or from reading the menu. Was it on par with Chili's? I think Z'Tejas would be a more fitting comparison. 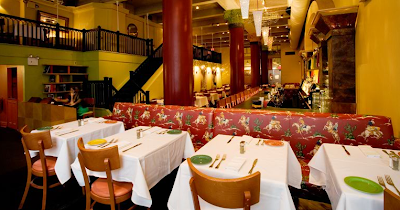 For me, Mesa Grill was a more upscale version of Z'Tejas with New York flair. It was a dining experience I won't soon forget. Question of the Day: Have you ever been to a Bobby Flay restaurant? If so, what did you think? If not, would you like to? If you're a fan of Wine Spectator and/or you like tasting great wines, you won't want to miss the New York Wine Experience October 22nd-24th, 2009 at the New York Marriott Marquis. There are several ways to take part in the event. 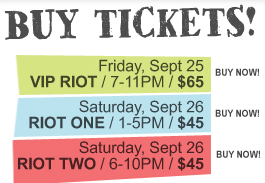 First is to purchase a $250 ticket for one of the Grand Tastings. 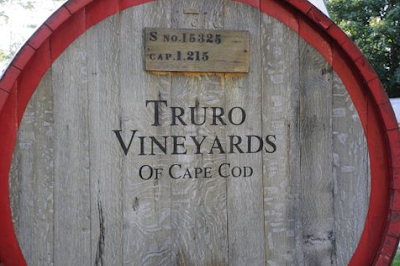 These are "expo-style" stand up/walk around tastings that feature an impressive list of wineries. Second is to purchase a $1,875 weekend pass that gives you admission to two nights of the Grand Tastings, some meals -and- (most notably) admission to sit down seminars moderated by Wine Spectator editors. Although I've never attended one of these events personally, the sit down format in particular has always looked attractive since they provide an opportunity to focus and learn more about specific wines right from the editors of the magazine.